Camping season begins Mother's Day weekend through October 15th. Our Newberry MI Winter Snowmobile Cabin Rentals will remain open through the end of the snowmobile season. Welcome to Kritter's Northcountry's Cozy Log Cabins, located in Newberry, Michigan. 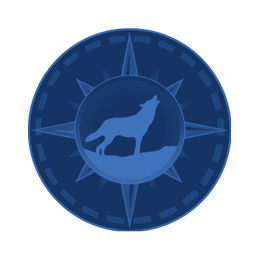 We are situated in the heart of Michigan's Upper Peninsula, where you will find a variety of lodging types to best suit your needs. Our Upper Peninsula Rental Cabins accommodate a maximum of 4 guests. The rate is the same whether there is 1 person or 4. Our 2 room cozy, heated Newberry MI Snowmobile Cabin Rentals have rustic charm and modern conveniences. Upper Peninsula Rental Cabins are similar to 'camping cabins' only larger and with more comforts. Cabin guests have full use of the campground facilities such as the nature trail, play areas, pavilion, laundry facilities, etc. Upper Peninsula spring, summer, fall & Snowmobile Cabin Rentals sleeps a maximum of 4 guests. At Kritter's Northcountry Campground and Cabins you will find all the bedding provided, you just need to bring towels and personal items. 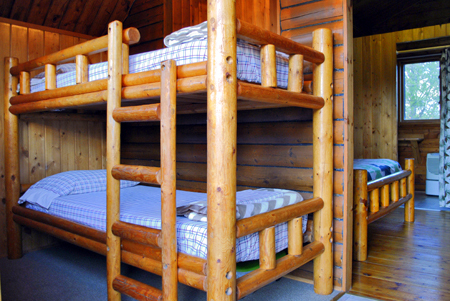 One room has a full size log bed and the other smaller room has a log bunk bed. The cabins also have a small table and chairs, microwave, fridge, 12-cup coffee maker and toaster. There is also an outside gas grill, fire pit, and picnic table. There is NO cooking allowed in the cabins other than what you can do with what we have provided or you may bring a crock pot (no hot plates, electric skillets or griddles, etc). You provide your own coffee mugs, table service, etc. The cabins do not have a TV or TV hook up. PETS ARE NOT ALLOWED IN OUR LODGING. ONLY CAMPING GUESTS MAY BRING THEIR PETS. In addition to the 2 rooms, there is also a shower and bathroom. For your convenience we have made the shower/dressing area separate from the bathroom. In other words, no waiting for the restroom if someone is showering. Please remember to bring your own towels and personal items. Our highest priorities are our guest's safety and security as well as the cleanliness & preservation of our property. Our usage guidelines are in place in hopes that everyone will respect our property and enjoy their stay with us. We feel you will appreciate the pride that we take in offering you clean, modern cabins & facilities. 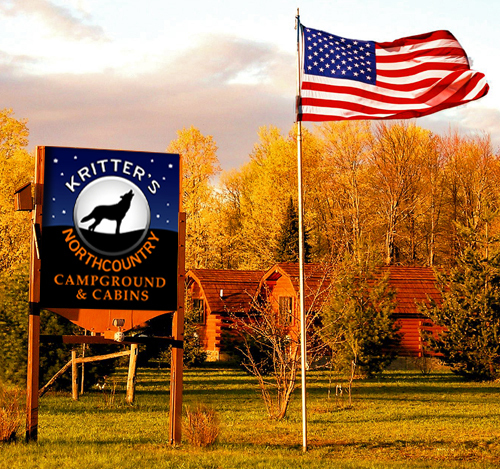 Kritter's Northcountry Campground and Cabins is conveniently located to the Eastern U.P. attractions! DON’T FORGET YOUR CAMERA!!! 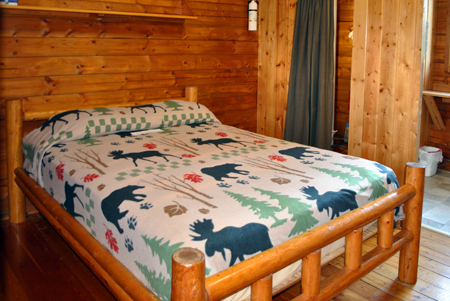 We invite you to check out our Cozy Log Cabin Photos by clicking the button to the right. Gallery offers larger view of each of the photos.